Picture the scene: you are in a residential home, sitting in your room. There is movement in the corridor, a quiet knock at the door – and a small donkey walks in to see you. He is not alone. Two smiling helpers from the Donkey Sanctuary are with him, one at his head, one at his bottom end. You break into a smile from ear to ear, then a wonderful laugh, and spend a priceless few minutes, talking to them and to the donkey. You relish the warmth of his breath as he breathes gently on you. You never thought you’d feel that gentle breeze or stroke a furry coat again. Such scenes are not unusual. Calm, gentle and quiet, donkeys give out their own quiet understanding and love in a way that only animals can. 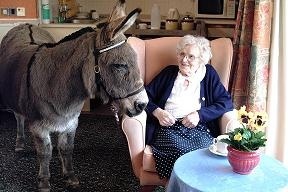 Donkeys from the Donkey Sanctuary regularly visit homes, adult learning centres and day care centres, and hospices. It is dedicated to providing riding therapy with donkeys to children with special needs and disabilities - but it also does wonderful work with the elderly. Staff at the Donkey Sanctuary work with Activities Managers in homes in particular to bring donkey magic to residents. 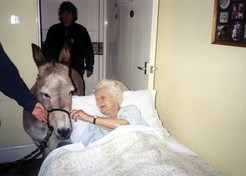 The donkeys tend to meet residents and staff in the homes’ lounges, except for those who are bedridden or too frail to leave their rooms, and then the donkeys paid them a personal bedside visit. The Trust has teams of donkeys, based in Sidmouth, Ivybridge, Belfast, Birmingham , Manchester and Leeds . Today they are a very busy group, with lots of successful visits and happy smiling faces behind them. One lady only puts her make-up on when Alvis is coming to visit. "These visits have a really fantastic impact on our residents," Bupa Care Home Manager Sarah Slym enthuses. Her home, Perry Locks in Birmingham, has about 120 residents, many who are terminally ill, or who have dementia and they find the visits very stimulating. Alvis, aged 20, visits several BUPA Care homes in Birmingham , and even goes as far afield as Nottingham. Amber Brennan from EST explains: “We tend to choose donkeys who are older; they’ve been there, done it and got the t-shirt, and nothing upsets them. They are used to hoists, wheelchairs, zimmer-frames, children and dogs. And they love the tea trolley - they like to see what biscuits are on offer!" After the donkeys return home, there is a tremendous buzz as everyone talks about the donkey’s visit. They bring back memories of times past for many of the residents and staff. Everyone talks about pets they had, all great and small. Residents and staff have a new – and safe – topic of conversation which will keep them occupied for some time. Importantly, the laughter and joy the donkeys spread about them has many health benefits to residents and staff. Their quiet unexpected presence relieves stress and reduces depression, enabling everyone to benefiting from donkey magic! Inevitably, questions spring to mind about health and safety. The donkeys seem to know not to go to the loo while they are in the home – but the polite, cheerful happy helpers from the Elisabeth Svendsen Trust carry a bucket with them just in case. The donkeys normally give a sign to the helpers that they need to go, and then they are simply taken outside to do the necessary. The donkeys receive training before they go into any home, so that they are used to walking down narrow carpeted corridors and travel calmly in the lorry. They are happy with the sounds of phones ringing, TVs blaring and computers humming. “I’ve got no hesitation in recommending other homes do this,” Sarah Slym says. “Fears are unfounded: any risk is very minor and greatly outweighed by the benefits of the donkeys visiting. And for us, the biggest impact is when we have animals and children visiting – the joy they bring to the residents is so very important."